Something always breaks – it’s part of cruising. Not a fun part, but an inevitable part. That’s just the way it is. If you can’t deal with fixing what breaks, you are not going to like your trip. On our first trip south, we were in the Erie Canal, heading east to the Hudson River. We met a boat heading back to the Lakes – basically going the wrong way for that time of year. The man on it had spent years building and getting his boat ready for his trip of a lifetime. But he turned around – before he even got to the ocean. Why? He said he was sick of working on his boat – sick of making repairs and fixing what broke. If that sounds like you, then you might want to rethink a trip like this. Are there ways to reduce the likelihood breakdowns? Lots of preparation can help. So can preventative maintenance, regular boat checks, and careful use. Plus a lot of really good luck. 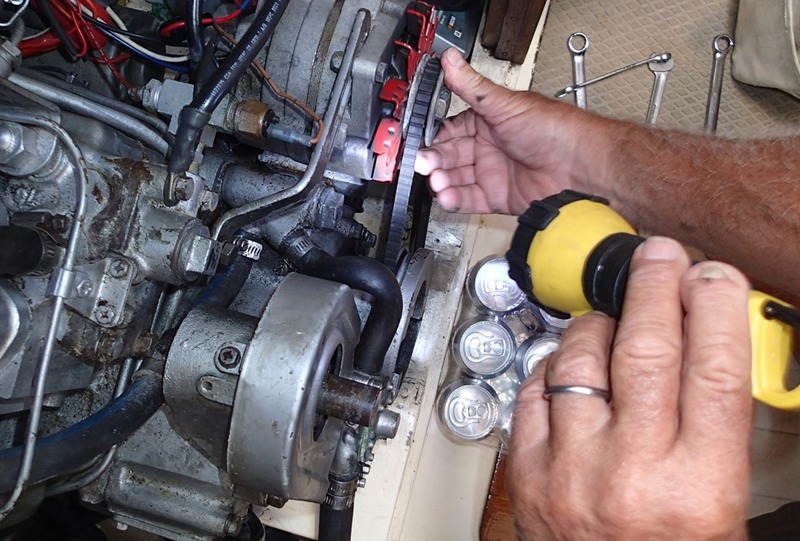 Here’s the thing about repairs – you can’t just call someone or “take it in.” Plus, the problem often starts with a crisis – there’s water coming into the boat, the engine is smoking, the dinghy motor quits out on open water, the toilet is leaking. Something must be done immediately and often safety issues are involved. Next comes a diagnosis of the problem – what’s wrong and why and what is needed to fix it. Sometimes the answers are very obvious, but many times they require an expert or at least a consultation with other boaters. Once the problem is identified, parts may be needed. A great deal of complicated logistics – and money – might be spent to get the parts to the boat. Hopefully they are readily available, i.e., they are still being manufactured. How long will it take to get the parts and where will you and the boat be while you wait? Some friends last fall waited a month for a new engine to be delivered after theirs burned too much oil to be reliably fixed. After you have the parts, they must be installed. Do you have the expertise to do it yourself? Can you find someone else to do it if you don’t? If you can do it yourself, do you have the right tools? Where can you find the right tools? And so on, and so on. Luckily, the cruising community is very helpful and you will find many boaters willing to share expertise, tools, and even parts. Once in Staniel Cay, on our last trip, a local guy made an alternator bracket out of an old abandoned boat trailer. Ingenuity, creativity and patience are mandatory. Preventative measures: Some boaters carry spare parts – that can be expensive, add weight to the boat, and take up scarce storage space. But it can save a lot of time and cost if that particular part is the one you need. Extra screws, bolts and other fasteners can be stowed without much space or weight. Carrying your own tools on the boat can ensure that repairs can be made efficiently. Some boats are actually designed with toolrooms and we have met boaters with quite sophisticated machine shops onboard. Another asset is your friendly relationship with the boat parts person at home who might be able to find the part you need and take a personal interest in making sure it gets shipped to you promptly. Making friends with the right person at the place it’s manufactured is even better. You should carry manuals for your systems and contact information for suppliers. And the more you know about how the parts of your boat work and how to take them apart and put them back together, the less a breakdown will impact your trip. Traditionally, cruising has been a very independent venture. Only recently has it become a turnkey leisure pursuit. Alternators: The main problems are brackets, the bolts that hold them on, and belts. Belts need to be periodically checked and tightened, but not overly tightened. On our boat, when the bolt holding the alternator bracket onto the engine sheared off, we couldn’t make our own electricity. 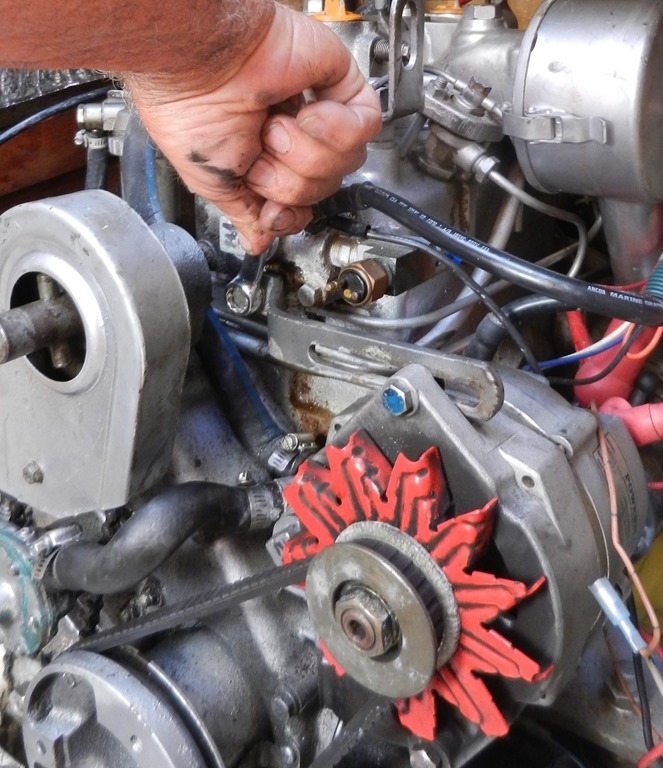 But on many boats, when the alternator belt goes, the engine can overheat because the same belt runs the water pump which cools the engine. Electronic accessories: refrigeration units, windlasses, water-makers, etc. Sometimes these can be repaired, but more than likely they will need replacing. Tricky to ship a new refrigeration unit to the Bahamas and get it installed. 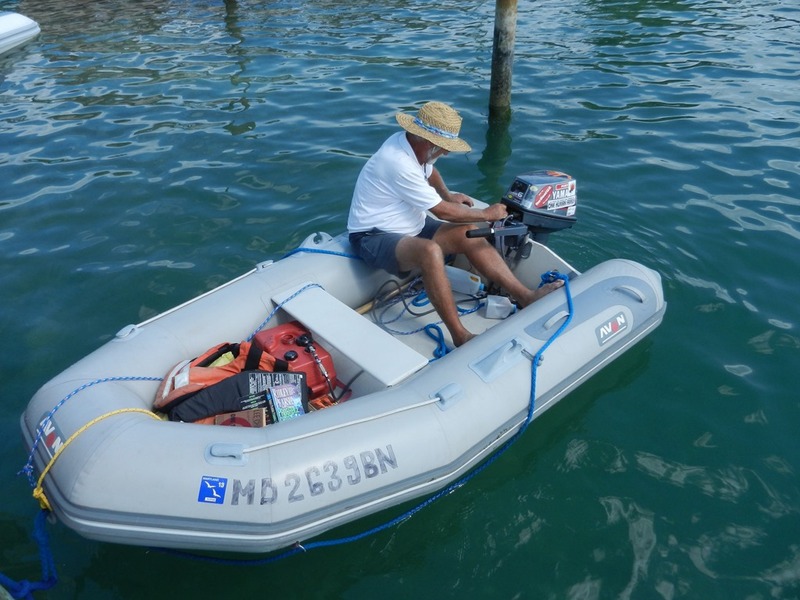 Dinghy motors: This can be a full-time job. Diagnosing the problem is typically the challenge here, closely followed by finding parts. 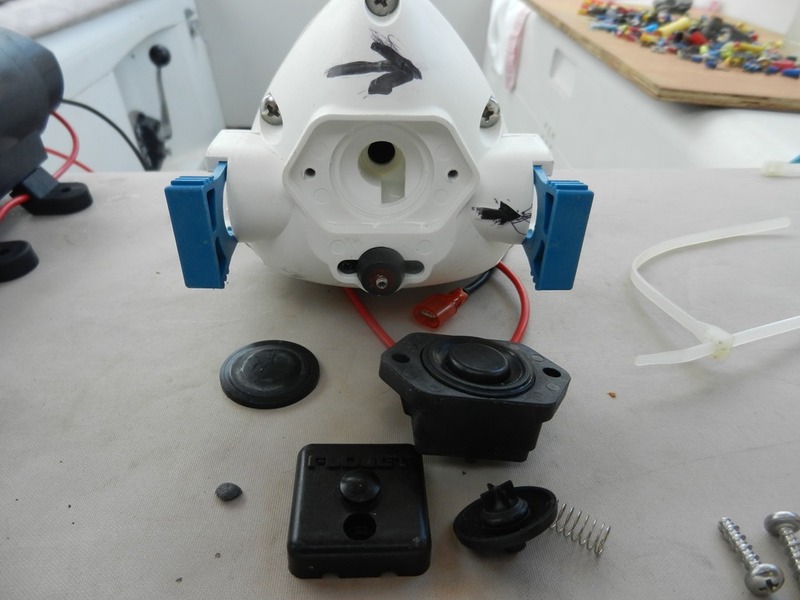 Marinas often specialize in only certain kinds of motors and if yours is not one of those kinds, you are out of luck. Add in metric vs. American size bolts, etc., and it starts getting even more complicated. Pumps: This is a water pump. They are used to get water to the sink, to cool the engine and to make the head work. Sometimes they can be fixed, but more often, they need to be replaced. Heads are a big source of repair issues. Even if the head works well, there are lots of hoses, valves, and fittings, plus a holding tank. They leak and clog and have to be cleaned and scraped and de-gunked. Yuck! I love our compost toilet. 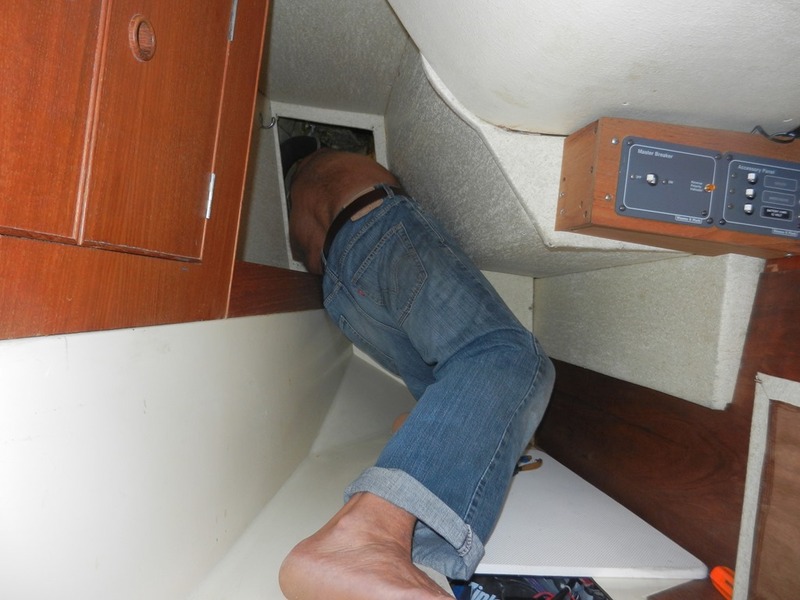 And of course no repair is going to be in a place on the boat that is easy to access. Here is Goldwin stuffing himself up through an opening door in the back of the quarter berth in order to re-position the SSB antennae. Sometimes you have to be a contortionist. Breakdowns don’t need to ruin your trip. Just know that they are a part of the experience, try to be prepared, and know how your systems work and where to go when something breaks. The one photo looks like a six-pack of beer below Goldwin’s flash lite. Now that’s preparation. Very interesting article. The side of the glamorous journey seldom seen — busted stuff and a guy working frantically to repair it while his spouse wanders around him helping by — taking pictures? Hey, this reminded me of our jeep trips!! A jeep is a constant source of breakdown/repair opportunities as well. And how that we have moved from a popup to a trailer…more opportunities! At least with that we can always make do until we can reach an RV repair place. Great article! Thanks for following our blog. I love your question. But seriously, you have to go back farther – my dad taught us to follow our passions. If you can’t do it all at once, sometimes in seriatum works. Someone said cruising is simply fixing your boat in exotic places. Good article. Based on your experience we are installing a compost head. That’s a great line – absolutely true. And we think you will love your compost head.